The Weyburn Beavers got eight solid innings from starter Garrett Waters in their 6-3 victory over the Regina Red Sox Monday night at Currie Field. Waters faced 32 batters giving up three runs on eight hits while striking out six. 325 fans watched as Beau Rabedeaux came on in the ninth to seal the victory and pick up the save for the visiting Beavers. Austin Alarid had a quality start for the Red Sox striking out seven while allowing three runs on four hits over six innings. Sox reliever Justin Magstadt had a rough outing giving up three runs on three hits. It was the first time in four appearances that the Rogers State product has given up a run. 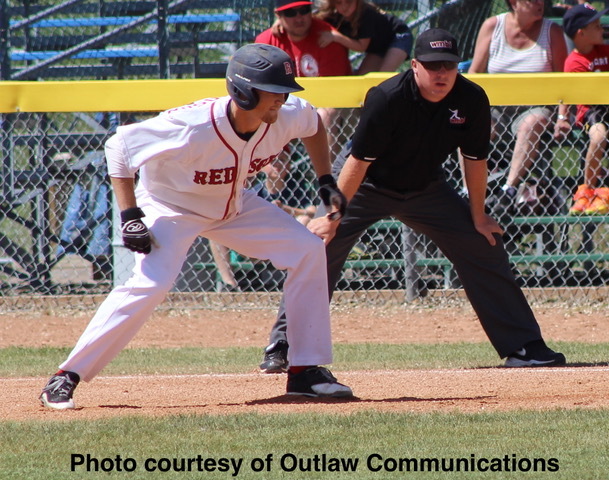 Anthony Wiggins had two hit and two runs for Weyburn, who jumped out to the insurmountable lead with three runs in the seventh inning. Regina’s Justin Erlandson, a senior at Utah Valley, continues to swing a hot bat, going two for five with a double and two runs scored. The loss dropped Regina to 3-2 on the season while Weyburn improved to 3-1. Next up for Regina is a visit from the Moose Jaw Miller Express on Tuesday. Game time at Currie Field is 7 pm. Swift Current brought their bats to Yorkton and hammered out 17 hits in their 13-5 win over the Cardinals. The 57s had hits from eight different players including a home run and five RBI from Brett Esau. Dondrei Hubbard continues to shine for Yorkton. Hubbard, a Maryville State product, homered, scored two runs and had two RBI for the Beavers. Garrett Goodall was credited with the 57s victory while DJ Depiero took the loss for Yorkton. Swift Current is now 4-0 while Yorkton, now 0-4 is still searching for their first win of the 2017 season. Strong pitching and timely hitting were a winning combination for the Lethbridge Bulls as they ran their recored to an impressive 5-0 with a 8-2 win over Medicine Hat. Bulls starter Wesley Moore pitched seven strong innings before giving way to reliever David Jones for the final two innings. Lethbridge slugger Alex Bishop, a member of Canada’s National Baseball Team, was three for four with three RBI. Stats for the Medicine Hat Mavericks were unavailable at the source.